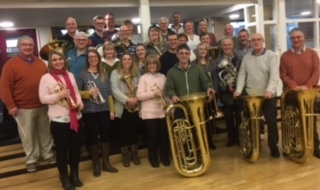 Stourport-on-Severn Brass Band was privileged to welcome the internationally celebrated musician and conductor, Dr Bob Childs to a rehearsal and tutorial this weekend. 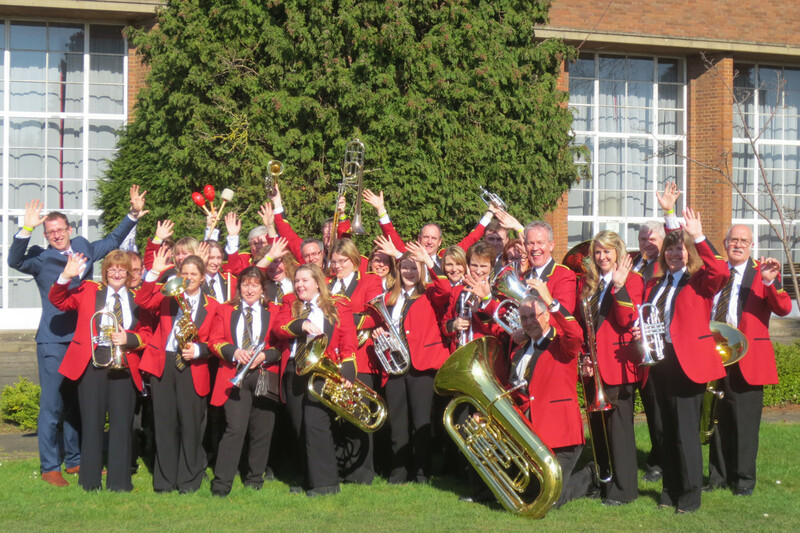 Having recently been promoted to the Second Section of the Midlands Brass Band Championships, Stourport-on-Severn Brass Band has been busy working hard to prepare for the Area contest in March. Then a chance meeting at a family wedding recently brought one of the band players and Bob together and when an invitation was extended for him to come along to a rehearsal, he accepted. Robert Childs (Bob) was born in the small Welsh village of Crickhowell and joined his first band, Crosskeys Silver, aged 9. Moving to Tredegar Town Band shortly afterwards, Bob won a coveted place in the National Youth Brass Band of Great Britain, where in the summer of 1974 he met his future wife, Lorraine Hartley.? Bob’s playing took him to the post of solo euphonium at Tredegar Band, whilst at that time, working by day at the Ebbw Vale Steel Works. Robert joined the GUS footwear band and in 1977, was asked to join the famous Grimethorpe Colliery Band on solo euphonium. 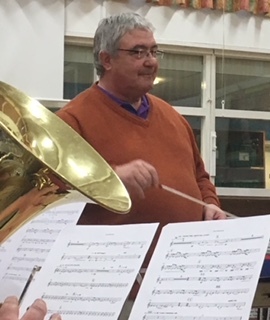 This was a first stepping stone to a long career of playing, conducting and teaching, writing and adjudicating, which took him around the globe with the most famous bands in the world, including Brighouse and Rastrick Band, Cory Band and Black Dyke Mills Band. The day at Stourport began with a morning rehearsal where Bob shared his expertise to advise the band on various aspects of its musical performance.? The second half of the day was spent with a musical tutorial where the band put down their instruments and Bob picked up his euphonium, demonstrating various techniques and exercises for players to take into their daily practice, to improve their own abilities. With experience of leading the world’s most famous bands, Bob’s response when asked how he found Stourport Band was inspiring.? He commented: “I really enjoyed the day. I enjoyed working on a piece where the band has already done the hard work, know their piece well and we can talk about adding style and “that something” that takes music to the next level. I particularly enjoyed working with Oli and sharing conducting skills. Stourport is a great, friendly band that made me very welcome. ?